Good morning! How many of you have been checking out Tim Holtz’ 12 Tags of Christmas? He never ceases to amaze and inspire me! I used yesterday’s alcohol ink technique on my card today. I guess you could say this is my take of Tag #2, with a little bit of inspiration from Wendy Vecchi thrown in. This card is also for today’s Rubbernecker Blogger Challenge, Nix the Ribbon. 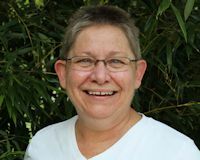 This week’s challenge is hosted by Bev Gerard, and you can find all the info and deets on the Rubbernecker Blog. I made the background using Eggplant, Stream and Gold Metallic Alcohol Inks. I smeared them on my Ranger Craft Sheet, added some Alcohol Blending Solution and then swirled and swiped white glossy cardstock through the mixture. I loved the results so much, and it actually reminded me of snow, ice and northern lights. 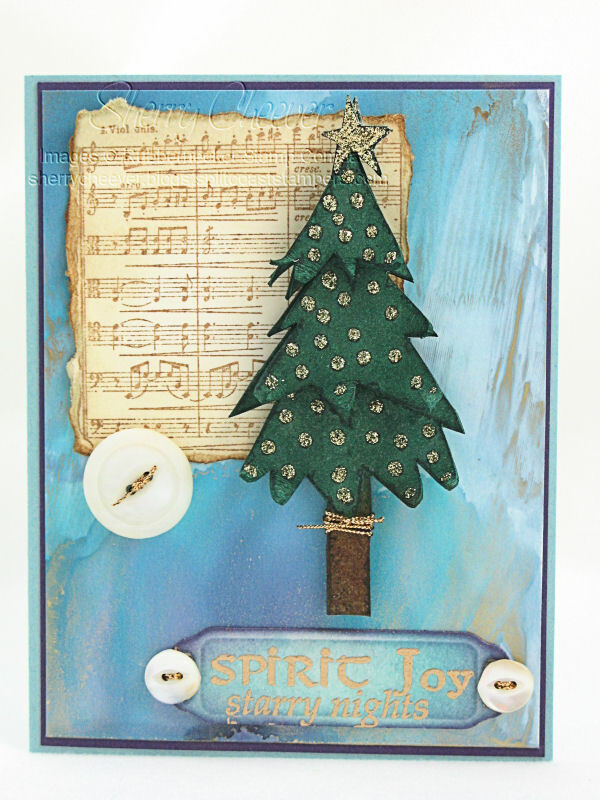 Here’s where I decided to add a Grunge Board tree, inspired by the Grunge Board flowers made by Wendy Vecchi. I stamped the tree image three separate times on a piece of plain Grunge Board. I cut them out, each time leaving off one layer of the tree. Each individual piece was inked with Pine Needles Distress Ink and then Gold Stickles were added to the exposed areas for each layer. It’s hard to see in this picture, but the ends of each layer are curled up to add some fun dimension. 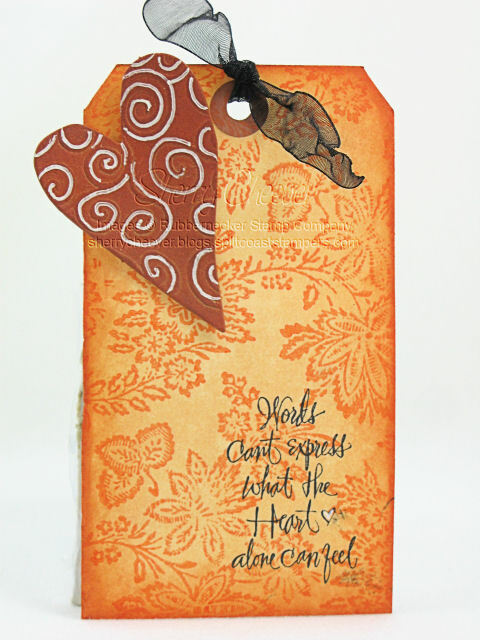 Instead of using Grunge Board for my sentiment, I die cut a piece of light weight chipboard with the Spellbinders Ribbon Tag Trios, applied my ink and then embossed the sentiment. Since we were to use no ribbon in today’s challenge, I went digging through my button collection for some old buttons, and tied them on using gold cord. Take the path less traveled – there’s always an adventure waiting for you! Happy Friday! 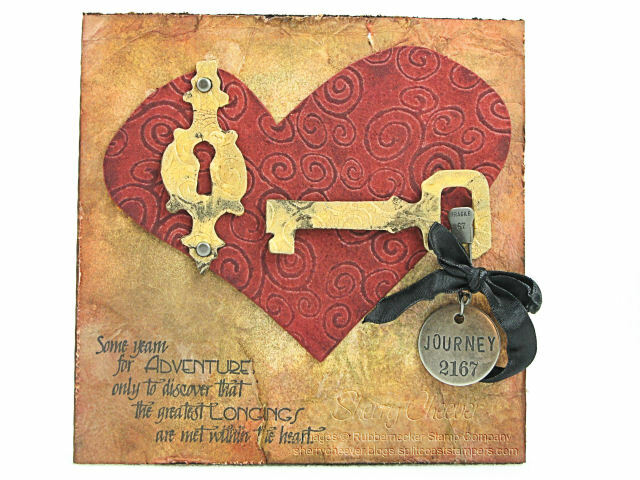 It’s rainy here today with a nip in the air – a perfect day to spend indoors stamping. I haven’t done a Splitcoaststampers Challenge in what seems like weeks. Actually it probably has been weeks with my traveling and all. I’ve checked in on them every day this week, but the mojo has failed me. All week long, the challenges have been in honor and celebration of Breast Cancer Awareness Month. They have gone PINK! Since this is a cause near and dear to me, I couldn’t let another day go by without participating. I think this is the first time that I have combined more than two challenges into one card. Today, I’ve combined four: the Color Challenge to use Pink Pirouette, Kiwi Kiss and Chocolate Chip; the Sketch Challenge; the Ways to Use it Challenge to use just one word; and today’s Limited Supply Challenge to use leaves. A few months ago I went to Cincinnati Stampaway with some friends, and bought a few of the new Studio 490 sets. I met the designer, Wendy Vecchi, at Winter CHA and was in total awe of her designs. I was so excited at Summer CHA to see that she had released sets incorporating her unique style with chipboard and grunge board. Today I finally broke them in and put a little ink on them! Let’s start with the Grunge Board leaves and flowers first. I stamped the images on the Grunge Board, cut them out, and then inked the leaves with Kiwi Kiss and the flowers with Worn Lipstick. An idea-ology Hitch Fastener holds the petals of the flower together. The background papers started as white. To give them color, I swiped both Pink Pirouette and Worn Lipstick on my Ranger Craft Sheet, misted the ink with water and laid my paper in the ink to pick up the color. Using a craft iron, I ironed over the paper to dry it. This process was continued to keep adding layers of color to the white paper. The sentiment, dream, was part of a phrase that I masked, inking only the one word to stamp on the third panel. Have a little fun today and stamp trying something new! Argh, Its Treasure Hunt Tuesday! Good morning! Tomorrow’s the big day when I head to Dallas and I can’t wait to visit with all the Texas girls! That leaves today, which is Tuesday, and of course that means its Treasure Hunt Tuesday at Rubbernecker. You can find all the deets on the Rubbernecker Stamps Blog! a bit monochromatic stamping, using three colors in the same family. I guess that’s about it for today. I’m hoping to be back a little later with something a bit different to show you. In the meantime, have a great day! Good morning and Happy Wednesday! Can you believe that it’s Wednesday already? I know I can’t, but then again, I’m still chasing myself around the house! Today is the Rubbernecker Blog Challenge. 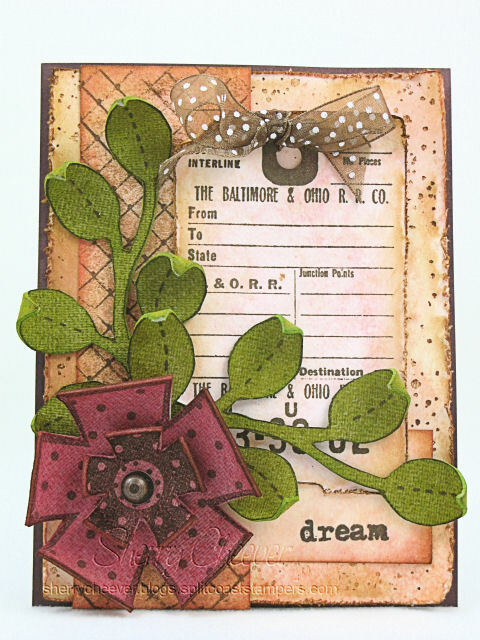 You can find more deets on the Rubbernecker Stamps Blog. The challenge this week is to use Grunge Board or Chip Board. I chose to work with Grunge Board and had a great time getting my fingers all inky! Actually, this isn’t even a card, but a 5.5 x 5.5 panel that I’m hoping to find a frame for. Better yet, it may become the focal point on another project. Who knows where this will end up! All of a sudden I can see a large canvas with many different project boards on it – . The heart was inked with Fired Brick and then highlighted with Aged Mahogany. The keyhole and key were first painted with Scattered Straw Distress Crackle Paint and then when it was dry, inked with Peeled Paint. To add more dimension to these pieces, they were lightly dabbed with a Gold Paint Dabber and then highlighted with Vintage Photo. The background paper is a 5.5 x 5.5 piece of Very Vanilla that was distressed by adding layers of color and drying in between each layer with an iron. There is a light spray of Vintage Photo/Pearl Pearlized Distress Mist that was diluted with more water and ironed to dry. I wanted this background to look like an old piece of paper that had been folded and refolded for years. The ribbon was melted with a candle lighter. The final project is mounted on a 5.5 x 5.5 square of cardboard. Here’s hoping you have a great day today and that you come play along with the challenge.